Happy Thursday everyone! Robin here with my inspiration of the week for Dies R Us! Although Memorial Day is the official start of summer in the US, I never feel it's summer until the 4th of July! We have a weather pattern here in Southern California that usually shows up in May and June called a marine layer. The marine layer makes the days overcast so we call it "May Grey or June Gloom". By July the June Gloom is gone and it's bright and sunny all day and we are ready for bar-b-ques, get togethers and such. My card started with stamping the Graphic Greeting Patriotic stamp, from Taylored Expressions onto kraft paper. I then cut out the stamped image using Spellbinders Deckled Rectangles and sponged the edges. After making my card base from red, white and blue patterned paper I added the Border Carnivale die cut, from Cheery Lynn and a canvas ribbon. The stamped image was embellished with star brads. TIP: The white star brad didn't quite match the off white in the card so I colored it with a Copic marker for a better match! I hope you have been checking out the Design Team's cards each week for some great inspiration! AND check out our Challenge Blog! Twice a month you have a chance of being chosen for a gift certificate to Dies R Us! What a superb card, love the border ! LOVE this card! That lace makes such a great contrast to the papers & ribbon, which I also love! Those star brads were the perfect touch! Super cute!! 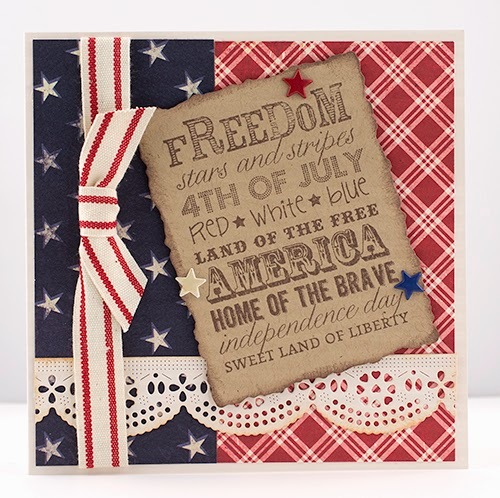 FABULOUS card for the upcoming 4th of July holiday! Great job Robin!